Fernandia Beach City Hall is located at 204 Ash Street, Fernandia Beach, FL 32034; phone: 904-277-7300. Photo: Tabby House, ca. 1885, 27 South 7th Street, Fernandia Beach, FL. Listed on the National Register of Historic Places in 1973. Photographed by User:Ebyabe (own work), 2010, [cc-by-3.0 (creativecommons.org/licenses/by/3.0)], via Wikimedia Commons, accessed October, 2012. Fernandia is known as The Isle of 8 Flags. Through its settlement history, the island frequently changed possession and was at various times ruled under 8 different flags: French, Spanish, English, Patriot, Green Cross of Florida, Mexican, Confederate and U.S. The city was incorporated in 1824. Fernandia, once an active port because of its natural harbor, is now an industrial city in which shrimp and menhaden fisheries and the manufacture of pulp paper are the leading industries. The tall, white stacks and brick buildings of the Fernandia pulp mills rise abruptly from the low shores of the St. Marys River on the north and east sides of the town, overshadowing faded red brick buildings once occupied by ship chandlers. The sidewalks of Atlantic Avenue, the principal thoroughfare, are roofed over with metal awnings, providing shade for leisurely shoppers. 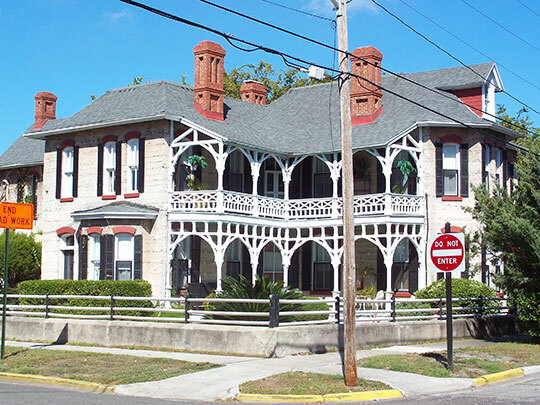 The town lies on the northwestern shore of Amelia Island, separated from the mainland by the St. Marys River estuary on the north, by the Amelia River on the west, and by Nassau Sound on the south. The city docks, 3 miles from the ocean, are reached by a 30-foot channel through Cumberland Sound and the Amelia River, a link in the Intracoastal Waterway. Three shrimp canneries along the waterfront rival the pulp mills in importance. Other plants produce fertilizer, fish oil, and feed for livestock. Although the city does not depend on tourists for its livelihood, its exceptional beach attracts visitors from all the southeastern States. North of the city on a hill above the marshes, a cluster of weathered dwellings occupied by fishermen and retired ship captains and pilots constitutes Old Town, the first settlement. A Spanish post stood here as early as 1686, at which time the island was called Santa Maria. In 1699 the English King, in granting territory to Carolina, included in it the northern half of the Florida peninsula, and in September, 1702, Governor James Moore of South Carolina led the English and their Indian allies to the island, captured the Spanish post, and destroyed its mission. Other attacks followed forcing large groups of inhabitants to flee, and by 1730 the island was deserted. In 1735 General James Oglethorpe, founder of Georgia, established a post manned by 50 soldiers, finding the island so beautiful that he renamed it in honor of Princess Amelia, sister of King George II. The War of Jenkins Ear, which began in 1739, brought renewed conflict between the Spanish and English. At its close the island was recognized as Spanish by the peace treaty of 1748, but retained a small English population, remnants of Oglethorpe's garrison. At the outbreak of the American Revolution the Florida colonials were loyal to the crown, and a British fort was erected at the north end of the island, near the present site of Fort Clinch. During a skirmish at the southern tip, the Americans burned a number of British houses and destroyed cattle. As the fortunes of the British in the colonies waned, large numbers of Tories came south to the island and remained until forced to leave in 1783 when Florida was returned to Spain. Many disappointed Englishmen went to the Bahamas, West Indies and Nova Scotia. Some went home, although a few transferred their allegiance to Spain and remained here. A large tract of land was granted by the Spanish government to Don Domingo Fernandez; included in it was the village named in his honor, Fernandia. Fernandia, lying just across the border, became a resort for pirates and smugglers in 1807 and 1808, when the Embargo Act and an act forbidding the importation of slaves were passed. A captain carrying a cargo of slaves not only had to run the gauntlet of government patrol boats, but also had to be on the lookout for hijackers, who usually lurked behind the marshy islands. Pierre and Jean LaFitte, it is said, were among the hijackers who preyed on the smugglers. Meanwhile Spain, its attention distracted by an impending war with Napoleon, was losing its grip on Florida. France, England and the United States all looked upon the peninsula as key to the Caribbean and Gulf of Mexico, and at one time 26 English warships lay off Fernandia harbor. As war between the United States and England became imminent, President Madison attempted to forestall English seizure of Florida, and appointed a commissioner to carry out his plans. General George Matthews sought to accomplish this by organizing a Patriots' Rebellion on his arrival in Fernandia. In March, 1812, an army of 200 occupied the Spanish fort without bloodshed and set up a "Republic of Florida." John McIntosh, its leader, had been promised protection and reimbursement by Matthews. Because of the objections of the Spanish and English minsters, McIntosh's followers finally withdrew, and Fernandia was once again returned to Spain. In the last few months of 1817, possession of Fernandia passed from one adventurer to another. Gregor MacGregor, a 31-year-old Scotch visionary and an advocate of South American independence, came into port with 5 vessels. The Spanish garrison surrendered, and MacGregor, with men recruited from Savannah and Charleston, formed a town government, appointed a mayor, and set up stores to sell merchandise landed from his ships. Soon Spaniards in East Florida joined forces and General MacGregor retreated. Jared Irwin, a former U.S. Representative from Pennsylvania, took over MacGregor's command, recruited an additional force among the privateers operating in Fernandia, defeated the Spaniards after a short battle, and took undisputed possession. At this time Luis Aury, a pirate of French ancestry operating on the Gulf coast, put in with 13 ships carrying loot said to exceed $60,000. Aury claimed the island and appointed Irwin "Adjutant General." Because he had been the first governor of Texas under Mexican rule and was still an official of that government, he raised the Mexican flag above the fort. In December 1817, Captain J.E. Henry brought the U.S. Corvette John Adams into the harbor under secret orders from President Monroe. He landed troops, met no resistance, and hoisted the American flag. Presently Aury sailed away to resume his career as a pirate. The island became officially American in 1821, when Florida was ceded to the United States. Because of Fernandia's importance as a port, the Government began to fortify the town in 1847, when work on Fort Clinch was started. Although there was a boom when the Florida Railroad made Fernandia its eastern terminus, the outbreak of the War between the States delayed the city's growth. Federal Works Agency, Works Progress Administration, Federal Writers' Program, Florida: A Guide to the Southernmost State. American Guide Series, Florida Department of Public Instruction, 1939.